A group of Belmont physics and music business students recently returned from a 10-day tour of Germany and Austria where they received unprecedented access to world-class facilities and personnel in electroacoustic research and product manufacturing. The trip consisted of two courses, a physics based course on electroacoustics taught by Belmont Associate Professor of Physics Dr. Scott Hawley and a music business course on international marketing, with a product design emphasis, taught by Belmont Assistant Professor of Entertainment Industry Studies Dr. Sarita Stewart. 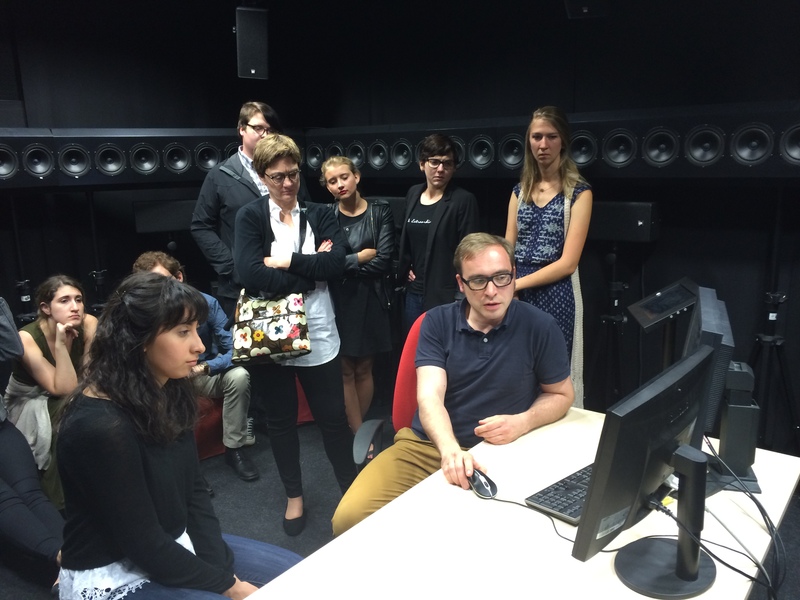 Before leaving for Germany, the group met Belmont alumnus Jon King of Nashville’s MikTek Audio for a lecture on the physics of microphones and a tour of the organization’s facilities. King also gave a demonstration on the fabrication process. While traveling, the group enjoyed personal sessions with top industry professionals including President of Gibson Dave Berryman, President of Neumann Wolfgang Fraissinet and Head of the Audio Communication Group at TU-Berlin Stefan Weinzierl, among others. Additionally, the trip included visits to many of Germany’s industry facilities and a few notable tourist destinations. Because of the trip’s exposure and coursework, Hawley said his students returned stateside with countless new skills and competencies including the ability to describe basic physical principles underlying electroacoustic transductors. Beyond their newly acquired skills, Hawley said the trip ignited a sense of excitement surrounding audio research among group members, as well the inspiration to consider business opportunities in product development and marketing. While traveling, the students maintained a blog highlighting key activities and lessons.